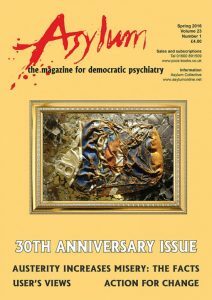 It is 30 years since the first issue of the magazine. For one reason and another there have been a few stops and starts along the way, which is why we are only now up to Volume 23. All the same, most of those years we provided an outlet for views and ideas which were never going to get much of an airing – if any – in academic and conventional channels. We are proud of our egalitarian standpoint: we always believed that patients – service users or survivors – have as much right as anyone to participate and speak their minds; we always believed that it is a barren and fundamentally unhelpful mental health expertise that excludes the voices of those who by personal experience know all about appalling emotional distress and mental turmoil. Unlike the previous four issues, which were themed on mental health and comics, most of this issue is different kinds of items sent in by readers. However, the centre pages are given over to a number of news stories about recent research findings on the mental health effects of the austerity measures imposed on the poorer half of the nation since the 2008 banking crisis. This does not make happy reading, but we think you may be interested. The summer issue is planned as a collection of perceptions from people active in the field. If you would like to contribute material, contact us. We would like people to address any or all of the themes: significant developments in the last 30 years (positive or negative); hopes or fears for the future; how to encourage the introduction of more democratic, more humane and more effective mental healthcare. Here’s to the next 30 years. May the powers that be finally wise up! Greta Williams Schultz is a part-time history student at Manchester University, and an activist and organiser with multiple physical disabilities and mental health problems. Sanchita Islam is the author of Schizophrenics Can Be Good Mothers, Too (Muswell Hill Press, 2015), written under the pseudonym Q.S. Lam. Peter Beresford is Professor of Citizen Participation at the University of Essex, a long-term user of mental health services and welfare benefits, and co-chair of the national disabled people’s and service-users’ organisation and network, Shaping Our Lives. Lucy Johnstone is a consultant clinical psychologist and former head of the Bristol Clinical Psychology Doctorate. She recently left clinical practice in order to work as an independent trainer. Sample article: Should mental health patients by forced to take medication by Sanchita Islam.